Dinner two nights ago came right out of the garden! Well, everything except the ling cod and the onion. These last few days (well all summer basically) have been pretty busy and hectic and it seems like I’m always scrounging around trying to find something to make for dinner. We’ve been picking lots of veggies from the garden so I just needed something to go with them. I went down to the deep freeze and decided that ling cod sounded good. Last summer Kevin went fishing in Alaska with my dad and he brought home a bunch of halibut, king salmon, coho salmon and ling cod. I don’t think that I’ve made any of the ling cod before and I wasn’t really sure what to do with it. So I started with thawing it and then laying it on a cedar plank. Then I opened my spice cupboard and searched around for something, anything that would work with this fish. I found Western Sizzle Salmon Seasoning. The bottle says that it’s great on all fish, so I decided to give it a try. I covered the tops of the fish with the seasoning and then set it aside while the grill was warming up. I then got my metal grill basket out and placed foil on the inside of it. I do this to keep the juices from running out. I then sliced up zucchini, yellow squash, green pepper, onion and threw in some cherry tomatoes. Then I drizzle extra virgin olive oil on the veggies and sprinkled Lawry’s Seasoning Salt and Garlic Salt on top. It was a pretty easy dinner to prep for. 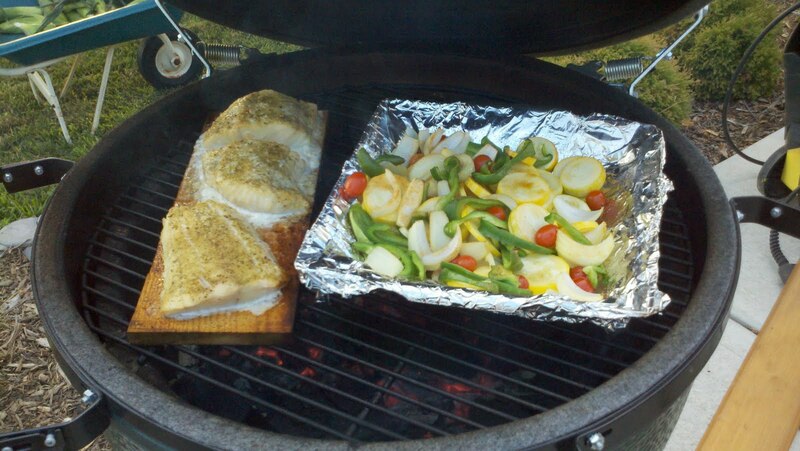 As soon as the grill was between 350-400 I placed the fish and vegetables on the grill. As those were cooking, I set a large pot of water on the stove to heat up. I also boiled some sweet corn that I grew in my garden. 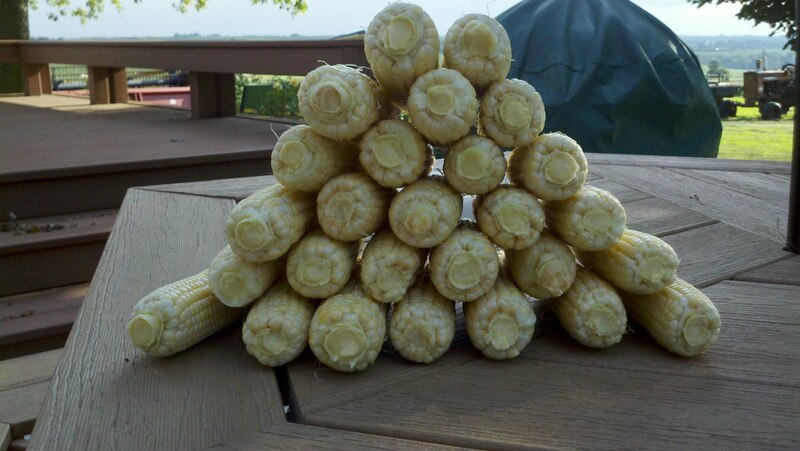 When I planted the sweet corn in my garden, it was basically to act as a wind break for the rest of the plants. My garden is a long rectangle that runs east and west and since we live on top of a hill, we get the south summer wind really bad, so I thought that planting two rows of sweet corn on the south side would protect the rest of the garden. And it did a pretty good job. 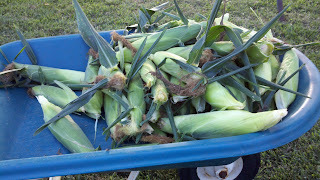 And even though it was only planted as a wind break, we’ve actually gotten quite a bit of corn from it. We’ve eaten it a few nights this week and last week and I’m hoping to freeze some of it. So, back to the food that is on the grill. I tried to keep the temperature around 350 degrees and I think both the fish and veggies were on the grill for about 25 minutes. I stirred the vegetables a few times but I didn’t do anything to the fist until the very end when I took a fork to it to see if it was cooked all the way through. 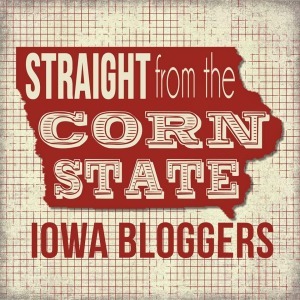 As for the corn, one the pot of water was boiling I placed the corn in the pot for 10 minutes. Our friend, Harry, was eating with us that night and everyone seemed to enjoy it all! It was very east to prepare and cook also! What are your favorite summer foods? Have you ever made/eaten ling cod before? If so, how was it prepared?